Apostolic Constitution "Virtue stands in the middle"
Article 1: Church Justice is administered by the Congregation of the Holy Inquisition, the Roman dicastery administered by a Cardinal-Chancellor Grand Inquisitor. Article 2: Church Justice is a general component of the justice of the kingdoms and also meets the moral imperatives of this, ["The Judges Charter"], but taking into account its place and mission. Article 3: Church Justice has jurisdiction over all violations of dogma, doctrine and Canon Law of the Universal Roman and Aristotelian Church. It decides on the orthodoxy of actions brought to be judged. Article 4: The jurisdiction of Church Justice extends as far as the shadow of Aristotle and can be applied over all parishes of the known lands. Article 5: Any individual may, unless otherwise approved by the qualified authorities, be plaintiff, defendant or witness. Article 7: Church Justice comprises of an Ordinary Justice and an Exceptional Justice, also called "Extraordinary". Article 9: Ordinary Justice is rendered in the first instance, for the faithful, by the Episcopal Office; for the clergy, by the Apostolic Penitentiary. Ordinary Justice is rendered in the second instance for the faithful and the clergy by the Roman Rota. Article 10: Exceptional Justice is rendered ​​in the first instance by the Inquisitorial Tribunal and in the second instance by the Supreme Tribunal of the Apostolic Signatura . Article 11: The Cardinals, whatever their nature or status, depend exclusively, for Ordinary Justice in the first and only instance, on the Pontifical Tribunal; for Exceptional Justice in the first and only instance, on the Supreme Tribunal of the Apostolic Signatura. Given and endorsed in Rome by the Sacred College under the pontificate of the Holy Father Eugene V the tenth of January, Sunday, in the year of grace MCDLVIII. First published by His Eminence, the late Brother Nico the third of August, Thursday, in the year MCDLIV; reviewed, sealed and published again by His Eminence Aaron Nagan, Cardinal-Chancellor and Dean of the Sacred College, the nineteenth day of March, Friday, in the year of grace MCDLVIII; reviewed, sealed and published again by His Eminence Arnault d'Azayes, Cardinal-Camerlengo, the seventeenth day of November on Tuesday, in the year of grace MCDLXIII. Ordinary Justice is one of two components of Church Justice. It is applied to cases, crimes and administrative misdemeanours, canonical and disciplinary. Ordinary Justice is rendered through four different routes depending on the nature and charge of the offending person. Thus, Ordinary Justice is rendered in the first instance, for the faithful, through the Episcopal Office and for the clergy by the Apostolic Penitentiary. Ordinary Justice is rendered in the second instance for the faithful and the clergy of the Roman Rota (Can 4-I-9). Ordinary Justice is rendered in the one and only instance for the cardinals by the Pontifical Tribunal (Can 4-I-11). Article 1: There is an Episcopal Office per diocese. The establishment of the Office is within the discretion of the bishop of the diocese notwithstanding any concordat or agreements approved by the Sacred College of Cardinals. The Office of the diocese where one finds the archbishop is called the Archiepiscopal Office. It compensates for any lack of suffragan episcopal office. - the Bishop of the diocese and two officials. By exception, an official may be replaced by a cleric of the province if circumstances require, particularly if they are party to the trial. - the Episcopal Prosecutor assisted by the Vidame of the ecclesiastical province on which the Episcopal Office depends. Article.3: The Presidency of the Office is the diocesan bishop. If the bishop is party to the trial, the case must be referred back to the archiepiscopal office or to a different episcopal office. Article 4: The Ecclesiastical Prosecutor is appointed for life by the diocesan bishop for which the Office depends, with the approval of the Congregation of the Holy Inquisition according to the conditions defined in the internal regulations of the Congregation. This can be revoked by a Cardinal Inquisitor on receipt of a detailed letter from the bishop presiding over the office. Article 5: The Vidame is responsible for enforcing the sentence, unless otherwise provided for in the judgment. Article 6: Officials are appointed by the Bishop for his Office, for their knowledge of Canon Law. They must be clergy. They assist the bishop, with whom they deliberate and are entrusted with the task, with the Episcopal Prosecutor, of record keeping and forwarding copies to the Congregation of the Holy Inquisition and the Pontifical Consistory concerned. Article 7: In the event where the Office cannot convene in full, it behoves the bishop of the diocese to refer the case to the archiepiscopal Office, or in the case of a lack of episcopal prosecutor, to appoint a general ecclesiastical prosecutor, or a missus inquisitionis acting as such by the Congregation of the Holy Inquisition as a replacement. Article 8: The Episcopal Office is responsible for acts committed in the parishes of the diocese where it has authority, or by parishioners residing in said diocese. In disputed cases, the Congregation of the Holy Inquisition or if unavailable the appropriate Pontifical Consistory attributes the procedure to the best suited court. Article 9: Any complaint or request to the Episcopal Office must be lodged in the hands of the Episcopal Prosecutor or his offices. Article 10: Referrals to the Office provided by the Episcopal prosecutor may include official business of his own, or mandated by an official of the Congregation of the Holy Inquisition, the Pontifical Consistory, or by a Cardinal. Article 11 : A pontifical consistory may, according to the Greand-Inquisitor, édictante specific rules about the officialities of its geodogmatic zone. Article 1: The Apostolic Penitentiary is the ecclesiastical court of first instance with jurisdiction in the judgment of the clergy of the Roman and Aristotelian Church. It depends on the Congregation of the Holy Inquisition. Article 2: Appeals of judgements of the Apostolic Penitentiary are processed by the Roman Rota. ​​- three judges, called “Penitentiaries”, including the Major Penitentiary. - the Commissioner leading the prosecution. Article 4: The President of the Tribunal of the Apostolic Penitentiary is the Major Penitentiary, appointed and dismissed by the Grand Inquisitor. If the Major Penitentiary is part of the trial, they are disqualified and replaced by the Grand Inquisitor. In the event of a language barrier, the Major Penitentiary is replaced by a Penitentiary. Article 5: The Penitentiaries assist the President of the Tribunal, with whom they deliberate and are entrusted with the task, with the Commissioner, of record keeping and forwarding copies to the Congregation of the Holy Inquisition and the Pontifical Consistory concerned. They are appointed by the Grand Inquisitor upon possible suggestion by the Major Penitentiary. They form the College of Judicial-Penitentiaries. They are disqualified and replaced if they are party to the trial. n.b. : The Grand Inquisitor appoints as many Penitentiaries in the College of Judicial-Penitentiaries as is deemed necessary for the proper functioning of the Apostolic Penitentiary. However, considering two Penitentiaries systematically attend the Major Penitentiary during the court session, a minimum of two penitentiaries is essential for the good performance of the tribunal of the Apostolic Penitentiary. Article 6: The Commissioner is appointed for life by the Major Penitentiary under the terms of the internal rules of the Apostolic Penitentiary and dismissed by him. They must be a priest. They lead the prosecution on the basis of evidence and testimony provided to them against the offending cleric. Article 7: The Apostolic Penitentiary is responsible for criminal or illegal acts in the Aristotelian dioceses by the clergy of the Church. Article 8: Any complaint or request from the Apostolic Penitentiary must be filed in the office of the Commissioner Apostolic Penitentiary. Article 9: Referral to the Apostolic Penitentiary provided by the Commissioner in charge of the case, may be enter in the tribunal on the mandate of one accountable to the Congregation of the Holy Inquisition, by the Pontifical Consistory or a Cardinal. Article 1: The Roman Rota is the ecclesiastical court of second and final instance for the Episcopal Offices and the Apostolic Penitentiary. It therefore has jurisdiction in the judgment of the faithful and the clergy of the Roman and Aristotelian Church. It depends on the Congregation of the Holy Inquisition. - Three judges, called "Auditors", including the Dean of the Tribunal of the Roman Rota. - the Rapporteur leading the prosecution. Article 4: The Presidency of the Roman Rota Tribunal is the Dean of the Roman Rota, appointed and dismissed by the Grand Inquisitor. If the Dean is party to the trial, they are disqualified and replaced by the Grand Inquisitor or the First Auditor. nb.The "First Auditor" is the primus inter pares of the college of auditors appointed by the Grand Inquisitor. They serve as a "vice-dean" of the Roman Rota and relieve potential absences by the Dean. Article 5: Auditors assist the President of the Tribunal, with whom they deliberate and are entrusted with the task, with the Rapporteur, of record keeping and forwarding copies to the Congregation of the Holy Inquisition and the Pontifical Consistory concerned. Auditors are appointed by the Grand Inquisitor upon possible suggestion by the Dean of the Roman Rota. They form the College of Auditors. If any Auditor is party to the trial, they are disqualified and replaced by another. n.b. : The Grand Inquisitor appoints as many auditors in the College of Auditors as is deemed necessary for the proper functioning of the Roman Rota. However, considering that two auditors routinely attend the Dean of the Roman Rota during court session, a minimum of two auditors is essential to the good performance of the tribunal of the Roman Rota. Article 7: The Roman Rota has a universal jurisdiction. It is applied to in the second instance for cases judged in the first instance by Episcopal Offices and the the Apostolic Penitentiary. Article 8: The Roman Rota has the right to confirm, modify or cancel the sentences for cases tried in the first instance by Episcopal Offices and the Apostolic Penitentiary. Article 9: Any appeal to the Roman Rota Tribunal must be filed at the main office of the Roman Rota. Article 10: Referral to the Tribunal of the Roman Rota is provided by the Rapporteur in charge of the case. Article 11: Confirmation of the judgment and sentence pronounced in the first instance results in an additional penalty at the discretion of the Tribunal of Auditors. Article 12: To ensure complete impartiality of the courts of Church Justice, members of the Roman Rota (Dean, Auditors and Rapporteur) or of the Officialities can not be a member of the Apostolic Penitentiary, or hold any office therein. Article 1: The Pontifical Tribunal is the ecclesiastical court of first and only instance for cases involving one or more cardinals as the accused. It depends on the Congregation of the Holy Inquisition. Article 2: The Pontifical Court is presided over by the Pope, or in his absence by the Cardinal Camerlengo, assisted by four cardinals selected by their peers. Article 2.1: If the Camerlengo is part of the trial, they are disqualified and replaced by the Archdeacon or the Grand Inquisitor. Article 3: The instruction of the trial is provided by a member of the pontifical court designated for this purpose by the Pope, or in the absence thereof, by the Cardinal Camerlengo. This cardinal instructor brings together evidence, interrogate the parties and witnesses, collects the confessions. Article 4: The charge is collectively conducted by the Pontifical Tribunal. It hears, behind closed door, the argument of the defense. Article 5: The entire trial record must be disclosed to the defense if it so requests. 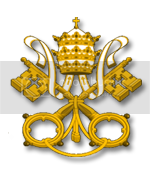 Article 6: The judgments are rendered, after deliberation by the Supreme Pontiff, or in his absence by the Cardinal Camerlengo. The decisions are subject to the principle of the majority. Article 7: The judgments of the Pontifical Tribunal are not subject to appeal. Article 8: Referral to the Pontifical Tribunal is only provided by the Pope or a Cardinal. Apostolic Constitution "Virtue stands in the middle". Extraordinary Justice is one of two components of Church Justice. It is applied to cases, crimes and misdemeanours, dogmatic and doctrinal. Extraordinary Justice is rendered through two different routes depending on the nature and charge of the offending person. Thus, Extraordinary Justice is rendered in the first instance, for the faithful and the clergy, by the Inquisitorial Tribunal. Extraordinary Justice is rendered in the second instance for the faithful and the clergy by the Supreme Tribunal of the Apostolic Signatura (Can 4-I-9). Extraordinary Justice is rendered in the first and only instance for the Cardinals by the Supreme Tribunal of the Apostolic Signatura (Can 4-I-11). Article 1: The Inquisitorial Tribunal is the religious court of first instance for crimes of faith and heresy committed by the faithful and the clergy of the Roman and Aristotelian Church. - a Missus Inquisitionis, called "Inquisitor", who combines the chair and gives the trial. Article 3: The Cardinals Chancellor and Vice-Chancellor of the Congregation of the Holy Inquisition appoint and dismiss the Cardinals Inquisitor, the prefects and the Missus Inquisitionis. Article 4: The Inquisitor may choose to enlist the services of a Notary selected from the Roman clergy. Article 5: The Inquisitorial Tribunal has a universal jurisdiction. It is applied to in the first instance for crimes of faith and heresy. Article 6: Everyone can make a complaint to the Inquisition tribunal. Article 7: Cardinals Inquisitor or inquisitorial prefects commission inquisitors by publicly stating the reasons that lead them to resort to the special court. Article 8: The inquisitor works alone and leads the investigation in secret. They bring together evidence, interrogate the parties and witnesses, collect the confessions. They judge the merits of the prosecution and draft the indictment. Article 10: The entire trial record must be disclosed to the defense if it so requests. Article 11: The Inquisitor and the Cardinal-Inquisitor or the Prefect who gave the commission render the judgment and decide the nature and the length of the sentence. Article 1: The Supreme Tribunal of the Apostolic Signatura is the religious court of first and only instance for crimes of faith and heresy committed by Cardinals; of second instance for the Inquisitorial Tribunal. It is therefore responsible for the judgment of crimes of faith and heresy committed by the faithful and the clergy of the Roman and Aristotelian Church. Article 2: The Supreme Tribunal of the Apostolic Signatura reports directly to the authority of the Sacred College and is administered by the Congregation of the Holy Inquisition for routine business. - five judges, including: the Prefect of the Supreme Tribunal of the Apostolic Signatura, the Chancellor or Vice-Chancellor of the Congregation of the Holy Office, the Chancellor or Vice Chancellor of the Congregation of the Holy Inquisition, or a Roman cardinal commissioned by the Sacred College in substitution of the Chancellors and Vice-Chancellors, and two titular Law Clerks, one appointed by the Prefect of the Supreme Tribunal of the Apostolic Signatura, the other by the Chancellor or Vice Chancellor of the Congregation of the Holy Office, from the College of Law Clerks. n.b. : The number of supernumerary Law Clerks may be reduced to two in case of shortages. Crimes of heresy being particularly serious, and to ensure complete impartiality of the trial, no Law Clerks may be appointed as titular Law Clerks or supernumerary if this appointment is concomitant with the referral to the Supreme Tribunal of the Apostolic Signatura or the referral to the Inquisition Tribunal for cases retried on appeal. Article 4: The Presidency of the Supreme Tribunal of the Apostolic Signatura is provided by the Prefect of the Supreme Tribunal of the Apostolic Signatura, appointed for life and dismissed by the Sacred College Cardinals. The Prefect must be a priest. If the Prefect is party to the trial, they are disqualified and replaced by the Chancellor or Vice Chancellor of the Congregation of the Holy Office. Article 5: Judges assist the President of the Tribunal, with whom they deliberate and are entrusted with the task, with the notary, of record keeping and forwarding copies to the Congregation of the Holy Inquisition and the Holy Office. If one of the two cardinal judges is party to the trial, they are disqualified and replaced by the Vice-Chancellor or Chancellor of the Congregation for which they are responsible. If a titular Law Clerk is party to the trial, they are disqualified and replaced by another. Article 5.1: The Notary is appointed for life by the Prefect of the Supreme Tribunal of the Apostolic Signatura and dismissed by him. They must be a priest. He has no right to speak at the trial. Article 6: Supernumerary Law clerks are silent observers of the trial. They attend but do not have the right to take part in any way whatsoever, except during the first deliberations where they are invited by the Prefect of the Supreme Tribunal of the Apostolic Signatura to comment on the deemed heresy. Article 7: The College of Law Clerks is composed of ten members appointed by the Sacred College of Cardinals on the recommendation of the Prefect of the Supreme Tribunal of the Apostolic Signatura, the Chancellor or Vice Chancellor of the Congregation of the Holy Office and the Chancellor or Vice Chancellor of the Holy Inquisition on the basis of their expertise in matters of dogma and doctrine. Half of the members of the College of Law Clerks must be priests. Article 8: The Supreme Tribunal of the Apostolic Signatura has a universal jurisdiction. It is applied to in the second instance for cases tried in the first instance by the Inquisitorial Tribunal; and in the first instance for cases involving a cardinal. Article 9: In the event of appeal of the first judgment of the Inquisitorial Tribunal, the Grand College of the Supreme Tribunal of the Apostolic Signatura meets to determine the admissibility of the appeal and decide, based on the minutes of the first trial, the legitimacy of a retrial. nb.The Prefect of the Supreme Tribunal of the Apostolic Signatura, the Chancellor or Vice Chancellor of the Congregation of the Holy Office and Chancellor or Vice-Chancellor of the Congregation of the Inquisition have the personal and exclusive right to enforce the admissibility of the appeal and the judgment on appeal by the Supreme Tribunal of the Apostolic Signatura. Article 10: The Supreme Tribunal of the Apostolic Signatura has the right to confirm, modify or cancel the sentences for cases tried in first instance by the Inquisitorial Tribunal. In the event of modification or cancellation of the sentence, the case is automatically retried before the Supreme Tribunal of the Apostolic Signatura. Article 11: Any appeal to the Supreme Tribunal of the Apostolic Signatura must be filed at the notarial office of the Supreme Tribunal of the Apostolic Signatura. Article 12: Referral to the Supreme Tribunal of the Apostolic Signatura is provided by the Grand College of the Supreme Tribunal of the Apostolic Signatura for appeals after judgment in the first instance; by the Camerlengo or the Archdeacon for cases involving a cardinal. Article 13: Confirmation of the judgment and sentence pronounced in the first instance results in an additional penalty at the discretion of the Judges of the Supreme Tribunal of the Apostolic Signatura.